Protection of wildlife is about preserving what remains special and mysterious about the world in which we live. The return of the American Bison to the Great Plains is a victory for preserving our American heritage. We get some interesting mail at Earthjustice, but one letter we received this week was too good not to share. It came from Detective Christopher Derry of the Los Angeles County Sheriff’s Department’s Fraud & Cyber Crimes Bureau, which immediately got our attention and had us on the verge of changing all our passwords. But Detective Derry wasn’t warning us of some imminent threat of identity theft. Addressing the letter to attorney Tim Preso, who leads much of our wildlife protection work out of Bozeman, Montana, Detective Derry explained that the bureau voted to make the American Bison its mascot, and he wanted to thank Earthjustice for our efforts to protect the species and restore it to its native lands. Sometimes we struggle to explain why protection of wildlife is so important to people, but this letter is a great example of the inherent value of these vital species. Protection of wildlife is about preserving what remains special and mysterious about the world in which we live. The return of the American Bison to the Great Plains is a victory for preserving our American heritage. 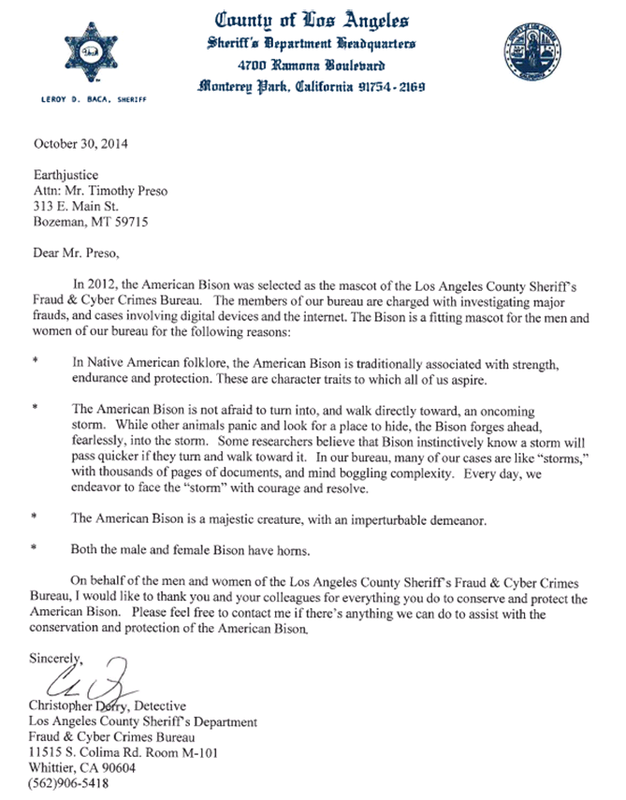 We thank the Los Angeles Fraud and Cyber Crimes Bureau for the work it does and for honoring this majestic creature.